This is a continuation of my first article on TransDigm (NYSE:TDG). Also, I suggest you read Citron’s article to provide the proper context. A note on my analysis: I analysed TDG inclusive of 2007, but there was one key data point missing for segment sales. To stay consistent, most of my charts start in 2008. Other than that, the re wasn’t anything inconsistent about 2007. I also ignored data before the business went public, focusing on the post IPO period. Also note that TDG’s annual year end is 30 September. Therefore, the year 2008 represents October 2007 – September 2008. So take that into consideration when aligning events such as dividends to annual data. Of course this is a wonderful business. 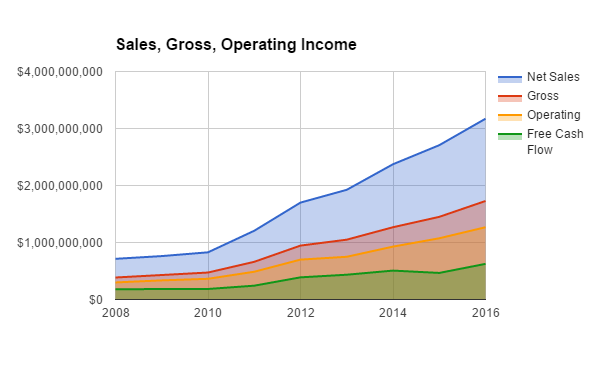 It has great growth in net sales and in scaling gross and operating income. 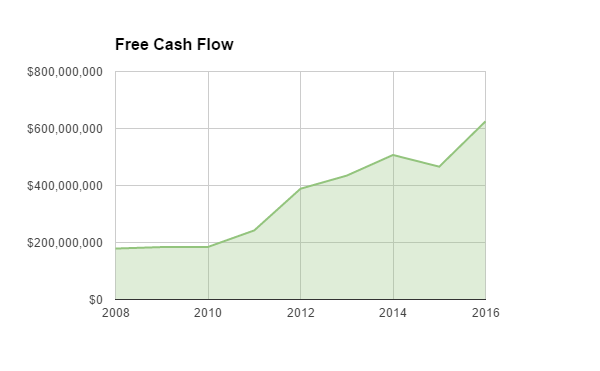 Free cash flow has tripled in the last 9-10 years. This is actually an interesting finding. Depending on when you bought, this business provided a 5-10x return over 10 years. That means that for each dollar of FCF, it was extremely undervalued early on and eventually each dollar of FCF become more valued. The growth really picked up in 2010. 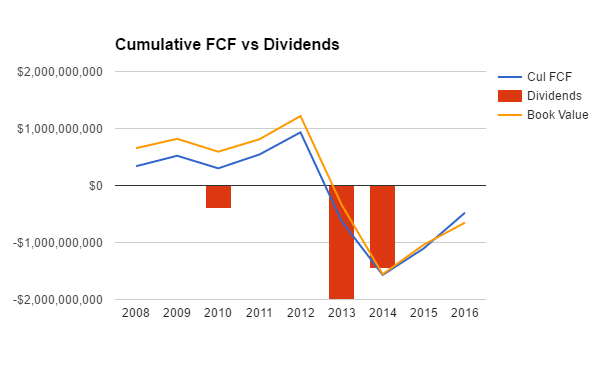 The business has paid out more in dividends than it has generated in FCF over the past 8 years. Note that I didn’t include 2017 FCF or the dividend paid out in the 2017 fiscal year (October 2016 – Dividend: -$1,376M; BV: -$1,874.6M). I think that it is obvious that the bond holders are funding growth and paying the equity holders. For that risk they received 7-12% in 2007 and just over 5 % in 2017. TDG is generating significant cash flow and could pay down debt, however it is rewarding its shareholders after the 10 year ride (note it wouldn’t make sense to pay down bonds since they are trading higher than their face value). But consider this – imagine you own a successful small business generating $200K profit/year for the past 10 years. Go to your bank and ask them for a $1M loan. Tell them you are going to use it to pay yourself a $1M dividend. Also tell them you won’t be backing the loan personally. The business indemnifies the debt. Would they loan you the money? Something to consider if you are a TDG bond holder. Is it bad to have negative book value? If you go back and read Buffett’s 1994 letter, you will see that the balance sheet isn’t really a good direct measure of business valuation (unless you are valuing the business purely based on a liquidation option). I don’t think TDG is at risk of bankruptcy, therefore liquidation valuation doesn’t apply here. Furthermore, net assets includes significant intangibles that are usually placed on the balance sheet based on a discounted cash flow (DCF) analysis. I’m going to value the whole business based on a DCF analysis of FCF. Including book value somehow would double count cash flows. In my last article (Part 1), I analysed several key macro level risks associated with the business. Let’s go into more detail with regards to the micro level business risks and assess how they could impact the future free cash flows. 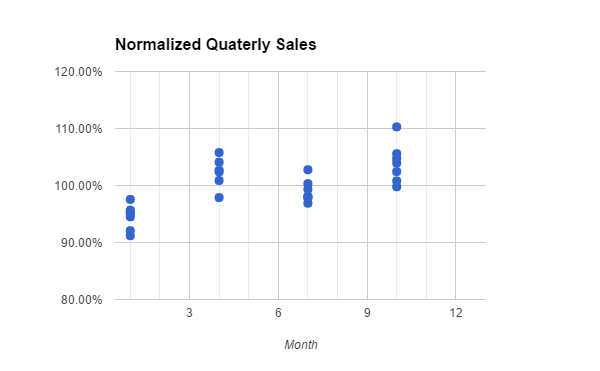 This analysis assumes that the gross margins in each segment are consistent year-over-year, however I suspect that there are swings and periods of pricing pressure that change individual segment margins. Also new acquisitions can greatly affect individual margins before TDG can implement pricing changes. Therefore, it’s not really accurate to assume margins are constant. We only have 9 data points (years) where TDG identified the breakdown between the four segments. 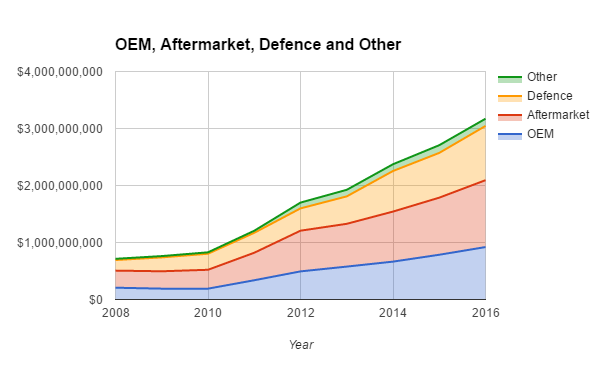 In 2007, TDG combined OEM and aftermarket into one segment. To get an accurate estimation and to pass a statistical test, we would need several more years. Again, the above issue of consistency would get in the way as individual margins would change year-over-year. These numbers are not accurate for the reasons stated above and are based on potentially flawed logic and an insufficient sample size. They simply represent the best fit curve to the data set provided and assume a constant gross margin (not changing year-over-year). I would imagine this is the lowest margin business. TDG wants to price competitively to become a main sup plier for the big manufacturers (i.e. Airbus/Boeing). The goal is to eventually become the proprietary provider for new fleets, so they should be willing to take an initial hit on their margins to get in the door. I suspect TDG provides parts directly to the OEMs at around 20-30% margins. Of all the segments, this one has the largest pricing risk. However, once they’re on the approved parts list, they can raise aftermarket prices. The OEMs could pressure TDG to lower prices, but since TDG owns many subsidiaries and provides hundreds of independent parts, it would be hard to implement. TDG is providing parts that do not make up the largest manufacturing costs to Boeing/Airbus, unlike fuselage, engine, avionic, flight control systems, etc. Therefore the OEMs are more likely to spend time negotiating expensive major systems than individual system components. Also note that most aircraft manufacturers give airlines multiple engine, avionic, etc options for each fle et. For example, you have the choice between a Rolls Royce (RR) or GE engine on the same aircraft. Each system or engine manufacturer might have different models that are approved for each aircraft type as well. The selection is usually based on what the operator wants to do with the aircraft and the airline’s existing relationship with the engine manufacturers. So GE and RR compete directly at the airline customer level. This doesn’t happen with TDG’s products. From my experience, purchasers of aircraft (airlines, military, etc.) don’t usually make acquisition decisions at the subsystem or component level. They usually think at the major system level and the overall cost-performance level of the aircraft. TDG parts are mostly below the aircraft operator waterline in terms of a strategic acquisition lens. I wouldn’t be surprised if this is the segment where TDG makes the biggest margins. As a result of its ability to acquire businesses with proprietary products in segments with little to no competition and where regulations and engineering costs far outweigh the benefits, airlines and other users generally accept the pricing of small replacement parts. Remember what I said in Part 1, this is an industry that accepts a $1,000 bolts as the norm. 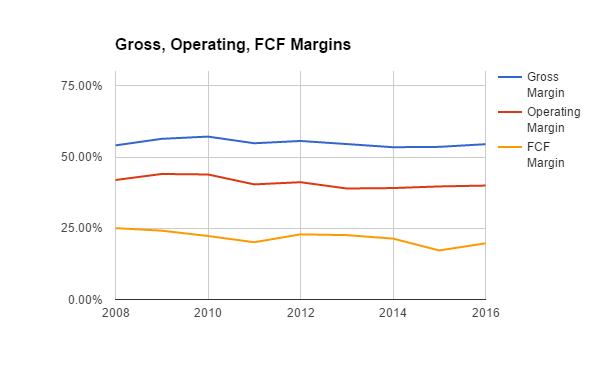 I wouldn’t be surprised to see gross margins way above 50%, even in the 80% territory. I would expect the aftermarket industry to continue to be a very high margin business. The airlines aren’t usually equipped with the specific engineering experts to design new replacement parts. It would be too expensive for individual airlines to develop replacement options. This segment represents non-aerospace businesses such as industrial and mining. I suspect this segment would have smaller margins because of less regulatory hurdles. However, these products can still represent life or death in these industries and provide reliability that is important to industrial and mining profitability. Therefore, it still makes sense for TDG to sell to these clients, however not in the case where it cannibalizes aerospace sales. 20% margins seems reasonable. This segment is small enough for TDG to absorb significant changes to profitability. This is the most interesting one as it relates to the “Profit Policy” identified in my first TDG article (Part 1). Considering what we know about TDG’s pricing strategy from the Citron article, the 2006 DAU report instructing Government con tracting officers to “improve” their negotiation tactics, and what I know about the industry, I wouldn’t be surprised if TDG’s defence margin business was around 40-50%. The more I read, the less I am concerned about any major risk materializing with respect to the pricing policy. I encourage you to read Citron’s article, then my part 1 article. Consider this: the risks highlighted by Citron were already highlighted by TDG’s annual report since 2006. Furthermore, TDG specifically responded to the 2006 DAU audit in the 2007 and 2008 annual reports. Did anything change as a result? No. Like I mentioned in Part 1, it’s far to difficult to implement a full audit program on TDG since TDG often has no direct contractually binding relationship to the Government. TDG does not have a significant amount of direct contracts with the DoD. In addition, the requested refund as a result of the 2006 DAU audit was “approximately $2.6 million for allegedly overpriced parts”(TDG 2008 annual report). An insignificant amount. Why doesn’t TDG generate more competition given TDG’s returns both on the commercial side and the defense side? If you’ re not already in this business, it’s tough to get in. It’s a long gestation period to get into. Product per product, they are pretty small market segments. In the M&A world TDG’s acquisitions tend to be smaller businesses. Not as exciting for the other bigger PE firms or even the mid-size firms. PE firms looking in a proprietary aerospace business who outbid TDG should be pretty worried. The only way you are going to win is making a higher bet on the margin improvement. TDG bought other firms doing the same thing. Odyssey started a roll up and TDG bought it. McKechnie started a roll up and TDG bought it. Have you seen changes in the marketplace in regards to your pricing? In total the pricing dynamics and the pricing numbers have not changed substantively for a number of years. Maybe one unit this year is a little better than another one, but they all tend to put and take and weight up to about the same number, which is one we track very closely. Is there any difference in your pricing policy between distributors or direct to a customer? In the military, we sell to the distributors and brokers where they get the same price. There is no difference there. In the commercial I don’t think there is a material difference. I do not see any fundamental difference or change in the profitability of the industry nor do I see a risk materializing that would negatively affect the profitability of the industry in the next 5-10 years. There have been some reports of channel stuffing, so it’s worth addressing this as a potential risk to the investor. First I’ll mention that I am not a forensic accountant, but I will try to analyse the situation as best I can. Revenue Recognition and Related Allowances: Revenue is recognized from the sale of products when title and risk of loss passes to the customer, which is generally at the time of shipment. Substantially all product sales are made pursuant to firm, fixed-price purchase orders received from customers. Collectibility of amounts recorded as revenue is reasonably assured at the time of sale. Provisions for returns, uncollectible accounts and the cost of repairs under contract warranty provisions are provided for in the same period as the related revenues are recorded and are principally based on historical results modified, as appropriate, by the most current information available. We have a history of making reasonably dependable estimates of such allowances; however, due to uncertainties inherent in the estimation process, it is possible that actual results may vary from the estimates and the differences could be material. Therefore, data points at month 10 represent the cumulative revenue during most the of peak summer months. 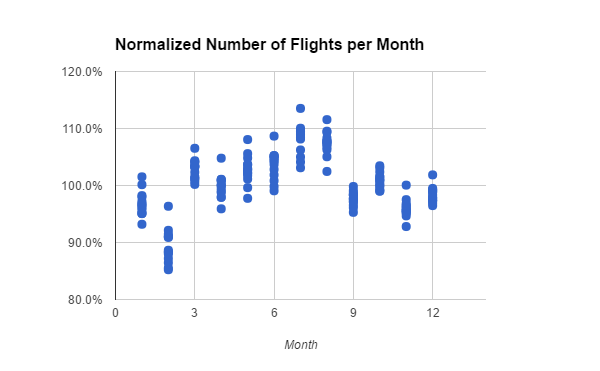 Data points at month 1 represent the culmination of months 10-12 and is indicative of the lowest peaks of air travel. 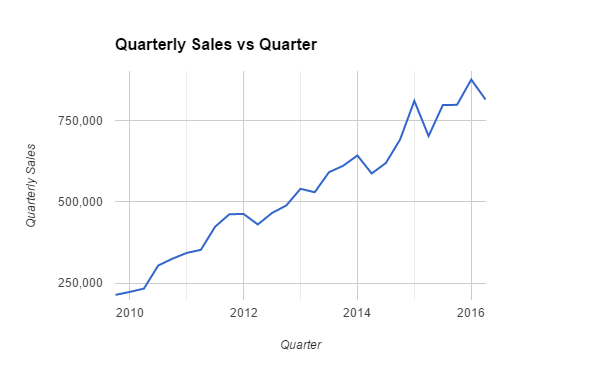 Therefore, it is reasonable to assume that the drop in sales after Q4 is significantly related to the change in flying rates during the fall quarter. As of September 30, 2016, the Company estimated its sales order backlog at $1,554 million compared to an estimated sales order backlog of $1,428 million as of September 30, 2015. 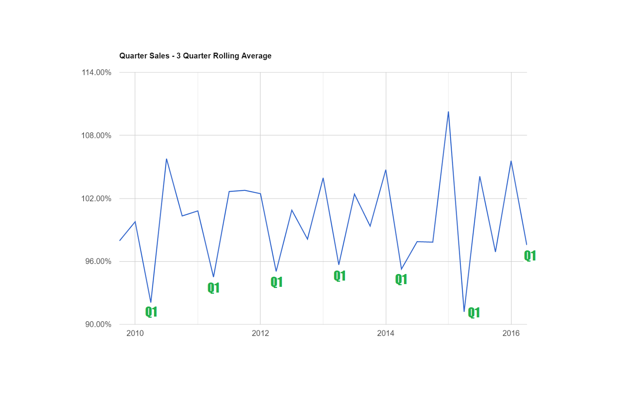 The increase in estimated sales order backlog is primarily due to acquisitions. The majority of the purchase orders outstanding as of September 30, 2016 are scheduled for delivery within the next twelve months. Purchase orders may be subject to cancellation or deferral by the customer prior to shipment. The level of unfilled purchase orders at any given date during the year will be materially affected by the timing of the Company’s receipt of purchase orders and the speed with which those orders are filled. Accordin gly, the Company’s backlog as of September 30, 2016 may not necessarily represent the actual amount of shipments or sales for any future period. Backorders are a negative if you are in a highly competitive business with little to no switching costs. This is because customers can simply move to another supplier if they are not getting their parts on time. However it can be relatively beneficial or insignificant in a monopolistic industry since customers don’t have a choice but to wait for parts. However, I would rather the company catches up to put more money in the pockets of the shareholders. On February 7, 2007, TransDigm Inc. acquired all of the outstanding capital stock of Aviation Technologies, Inc. (“ATI”) for $430.1 million in cash. ATI consists of two primary operating units that service the commercial and military aerospace markets-Avtech Corporation (“Avtech”) and Transicoil LLC (which, together with Transicoil (Malaysia) Sendirian Berhad is referred to as “ADS/Transicoil”)… Mr. W. Nicholas Howley, Chairman and Chief Executive Officer of TransDigm, and Mr. Douglas Peacock, a director of TransDigm, each indirectly owned less than one-half of 1% of ATI’s outstanding equity on a fully diluted basis. In addition, prior to the acquisition, Mr. Howley and Mr. Peacock were directors of ATI commencing in 2003, and Mr. Peacock served as ATI’s Chairman from 2003 through February 2007. I think it would be good practice for Mr. Howley to provide some amplification about his involvement in Bratenahl Capital, especially his son’s ownership and management o f Bratenahl Capital’s businesses that are potential acquisition targets of TDG. But I’m not fearful of that relationship. I think that Mr. Howley has been an excellent steward of shareholder value, but I am open to more disclosure. As of year end 2016, TDG was generating about 2.6 times its interest expense in operating income. If TDG dedicated all available FCF to paying off debt at face value, it would take around 16 years, assuming zero growth. Another thing to consider is that although TDG has an S&P “B” credit rating, it is able to raise debt at 5.2%. You could compare debt level metrics to other businesses, but it really comes down to how confident are you in the business to continue to generate and grow FCF to service the debt. If you believe that future cash flow problems will appear, then perhaps an adjustment could be justified. However, at this point my main concerns is rising interest rates and its effect on bond rates. Therefore, in Part 3 I will make some interest rate adjustments to my future cash flow predictions. I’m also concerned about TDG’s ability to raise further capital through debt and continue to make strategic acquisitions. I think TDG has a lot more room, but it is a consideration as a growth barrier. In this article, I focused on some of the mircro level risks facing TDG’s future cash flows. After carefully analysing these risks in detail, I do have some minor thoughts and concerns, however nothing that is out of the ordinary for investing in any business. Citron did raise some good points about TDG (and probably made some good money on the short). I would encourage any formal analyst to ask specific questions during the conference calls to seek amplification on points raised by this article or previous shorting articles. Of course, there are dozens of other risks that face TDG which are highlighted in its annual report. I encourage you to read it and factor those risks into your own judgment. The risk section is one of the most impor tant parts of the annual report. It is management’s (expert) opinion of issues that could directly influence how much credit you give to future cash flows. In the case of TDG, reading management’s interpretation of risks could have clarified unanswered questions regarding the recent shorting articles. About this article:ExpandAuthor payment: $35 + $0.01/page view. Authors of PRO articles receive a minimum guaranteed payment of $150-500. Become a contributor »Tagged: Investing Ideas, Long Ideas, Industrial Goods, Aerospace/Defense Products & Services, Editors’ PicksProblem with this article? Please tell us. Disagree with this article? Submit your own. This entry was posted in Stocks on March 30, 2017 by admin.